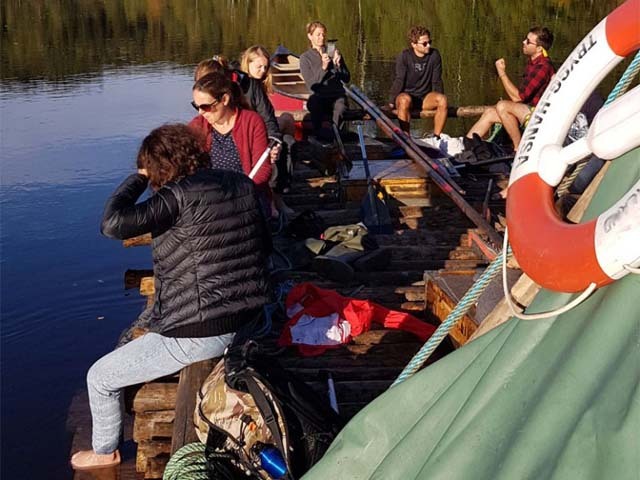 Sofia from the Nature Travels team goes with the flow on a timber rafting trip down the Klarälven river in September 2018. 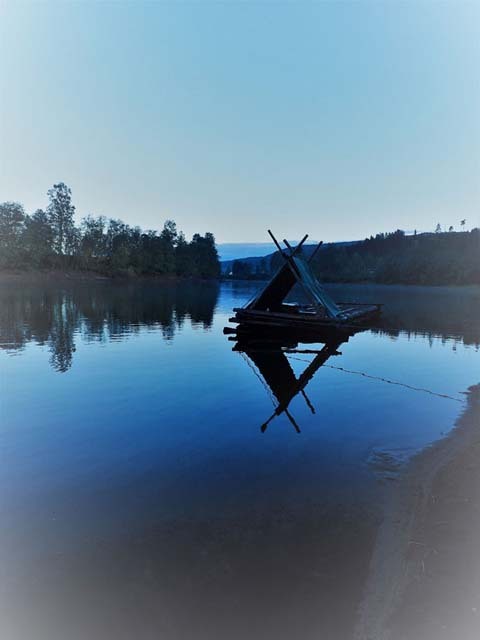 Timber rafting on the Klarälven river grew out of the tradition of forestry companies to use the river to transfer timber from the logging sites down to Karlstad. Nowadays the timber is transported by lorries, but the forestry companies still provide the logs that the timber rafts are built with. 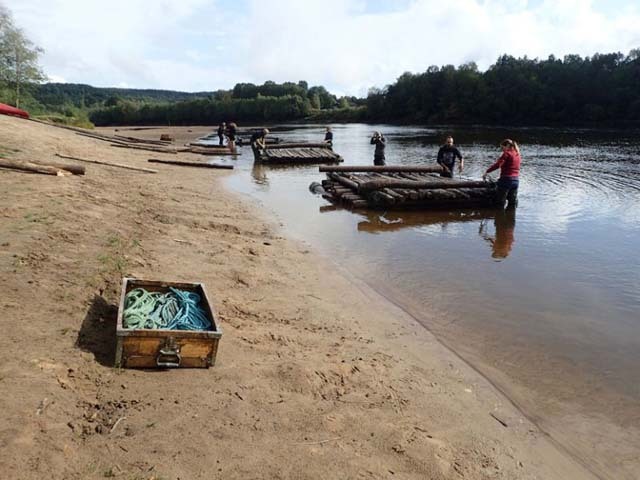 The logs are delivered to the building sites and then used for timber rafts for five years before they are sold back to the forestry industry. The raft is built in layers using logs stacked on the shore. Photo: Sofia Carter Nature Travels. 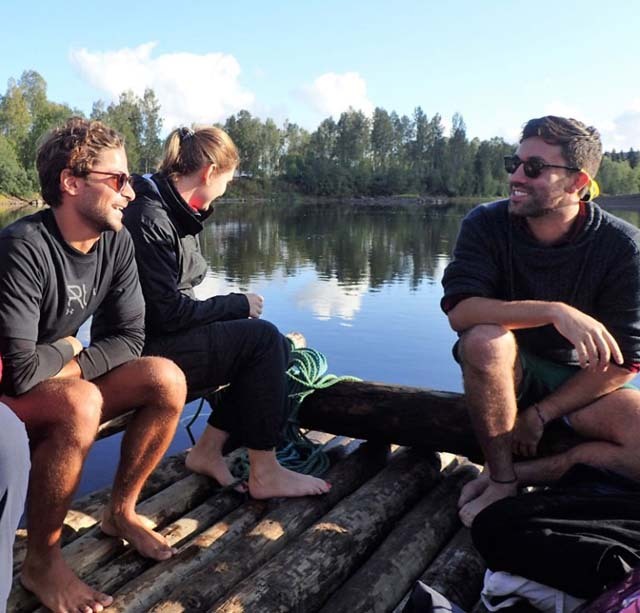 We had come to do a shorter timber raft tour for just over 24 hours. This was going to be my fourth time on a timber raft on the Klarälven river (my first time being as a Swedish scout many years ago!). We started off at the timber raft centre with an information session, learning more about the tradition of log driving on the river and also how to build our raft. 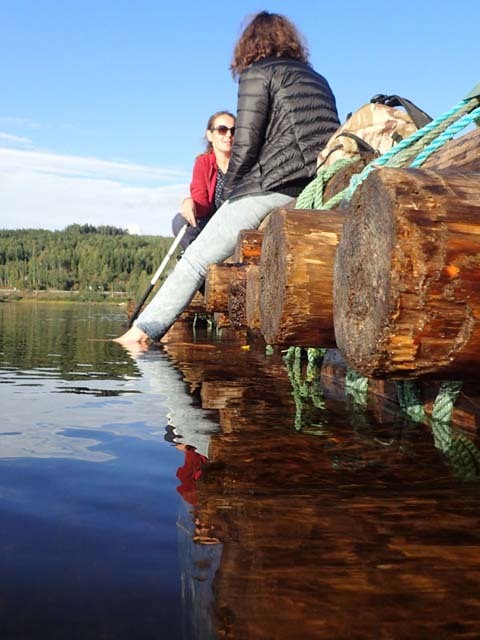 A timber raft is built using only ropes and logs. Photo: Nature Travels. After this we packed in to the minivans and were driven up river to the building site. A normal-sized timber raft is 3m x6m and consists of two 3m x 3m sections. On that size if timber raft you normally have a maximum of 6 persons. As our group was a bit largerw we were going to build a 3m x 9m consisting of three 3m x 3m sections. To do this, we divided up into three smaller groups and each group started on one of the three sections. 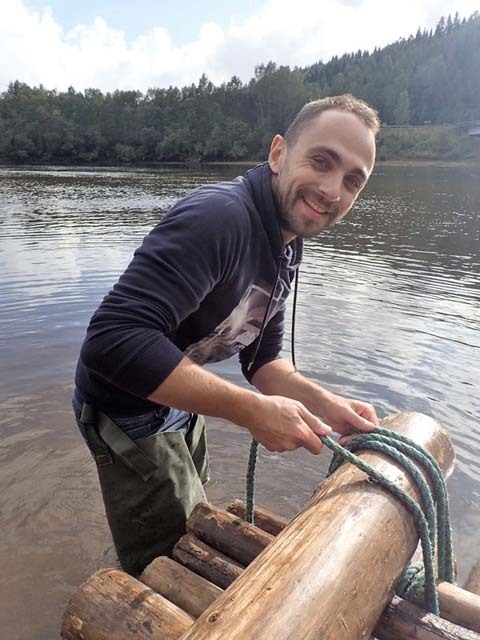 Building a timber raft can be hard work, but it’s great fun! Photo: Sofia Carter Nature Travels. Up on the bank different log piles are stacked and from these we needed to choose the logs we wanted and roll them down the bank into the water, where some of us where standing building the raft. Some choose to borrow waders, others decided to do go bare-legged. When building the sections, each section has three layers. The bottom one consists of the largest logs with a diameter around 50-40 cm. These then get tied together. The second layer consists of logs with a diameter of around 20 cm, while the top layer is build with the smaller logs. As the logs on the bottom layer are larger, we needed fewer of these, around 10 of them, and then more on the middle layer and the most for the smaller ones forming the top layer. When all layers were done, we tied the three sections together forming a larger raft. We added sitting logs around the edges and a little shelter on one end and then it was time to load the equipment we were bringing with us and cast off! The shelter provides protection from sun, wind and rain. Photo: Sofia Carter Nature Travels. At the beginning, everyone found it rather diffucult to relax and go with the flow – literally – and you could see that most wanted to steer the raft or be able to control it in some way…but after an hour on the river everyone slowly started to relax into it. The water is warm enough for a swim or just to cool your toes! Photo: Sofia Carter Nature Travels. After being an hour on the river, the flow pushed us towards the outer edge of one of the meandering curves and you could see that it was getting shallower under the raft. Then suddenly we stood still. Photo: Sofia Carter Nature Travels. We had got stuck on a sandbank. We did know from our instruction that we needed to go back in the direction we came from, but we paddled and pushed with the poles and we didn’t seem to move anywhere until Ian and Georgie bravely jumped in the water and pushed the raft while standing in the water. Suddenly it all loosened up and we were back in the flow of the river and the raft started moving down river, but how to get Ian and Georgie back on the raft!?! They were standing on the sandbank and we were slowly drifting away. Luckily we had a canoe with us and could get them with the canoe and then onto the raft again. Towards evening time we reached the point where we were going to stop for the night. We paddled a line ashore and slowly got the raft to land on the edge of the river. But there was still water between the raft and shore, so we used the canoe to shuttle people and equipment to the shore and made sure the raft was securely tied to some trees for the night. Timber rafting can be great for groups and is very much a teamwork activity. Photo: Sofia Carter Nature Travels. When we walked down to the raft the morning after, the water levels in the river had sunk and our raft was now stranded on the river bank. With a deep sigh, we all started to push and wriggle the raft, trying to get the raft to move into the deeper water flowing to the side of it. But the three parts tied together weighed around 6 tons or more – we had no chance. So we had to separate the parts from each other, move them one at a time, hold on to them when they got loose so they didn’t float down river while we got the other parts loose, and then tie them back together. It sounds more complicated than it was, and in the end we were “unstuck” and loaded everyone back on the raft and continued our journey downstream. As long as someone is keeping watch and steering the raft, the others can relax for a while! Photo: Sofia Carter Nature Travels. The day passed relatively uneventfully. 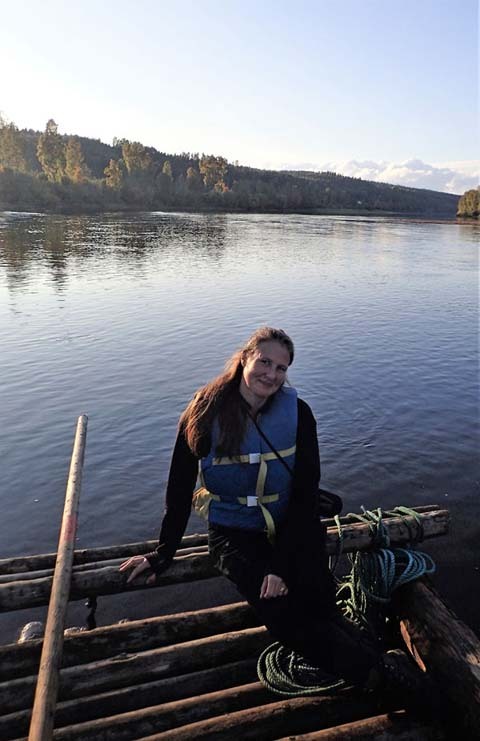 We had a coffee break and lunch on the raft and used the canoe to make trips to the shore or just to take pictures of the raft from the water. After a long, dry summer the river was flowing really slowly and in some parts where we had a headwind, it was almost like we were standing still. This meant that our travel down the river took a lot longer than planned, but it didn’t make it less enjoyable, and again is just part of the experience. Beautiful light on the river. Photo: Sofia Carter Nature Travels. In the early evening we reached our end point and now needed to land the raft in the area of the log trap. The log trap is a construction that gathers the logs together once you have separated them from each other. Forestry machines then lift the logs out of the river and transport them back up the river to the building site to become new rafts! 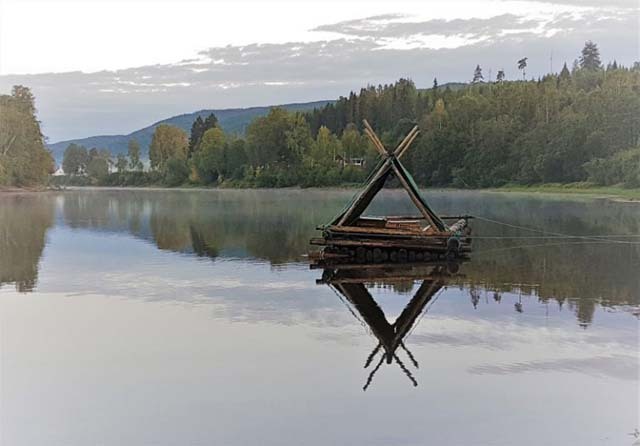 A 3m x 3m raft reflected in calm waters of the Klarälven river. Photo: Sofia Carter Nature Travels. It is a balancing act to get to the shore at the right place and not miss the log trap and continue down river, but we managed in the end. 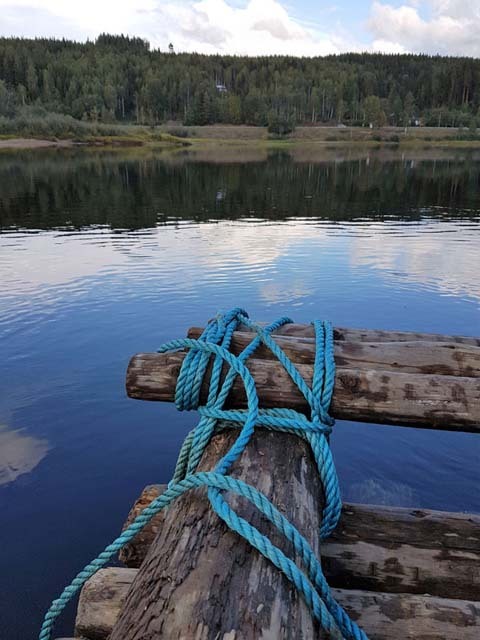 Once we had landed the raft and emptied it of people and equipment, it didn’t take that long to take the raft apart, gather the ropes togther and let the logs drift away and get trapped in the log trap. 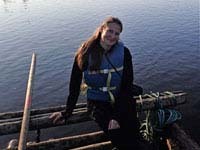 Sofia from the Nature Travels team built her first timber raft as a Scout in Sweden! Photo: Nature Travels. Our timber raft experience was over for this time, but I think we will all remember it for a long time! 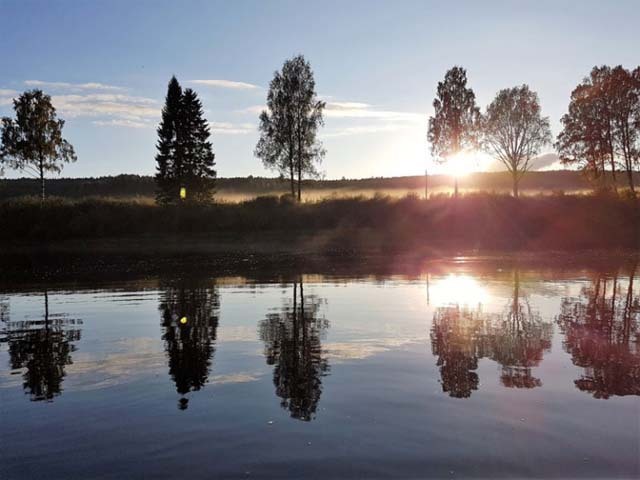 Nature Travels offers three options for timber rafting adventures – the “standard” tour is Timber Rafting on Klarälven – choose between a 5-day or 8-day trip with wild camping covering 50km or 100km of the river. 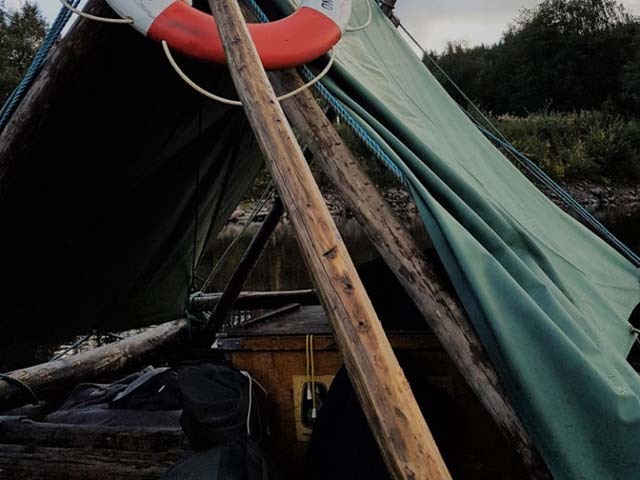 Alternatively, opt for the “full service” Timber Rafting with Added Comfort option or combine the shorter Timber Rafting Taster with one of our many canoe tours in the area such as Canoe Tours on Svartälven.